Our formal-style Amish Small Console Curio Cabinet features will accent any space with its clean design that includes a moulding-like base. 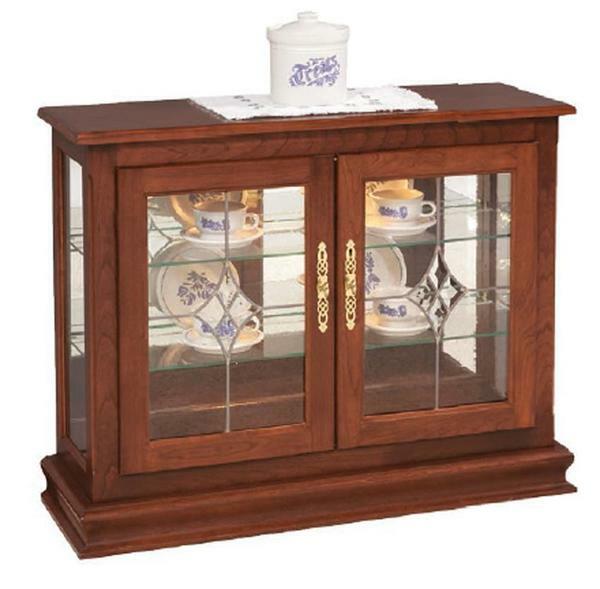 Use this display case cabinet in a dining room to showcase your fine China that has been in your family for generations, in your bedroom closet to protect your designer handbag collection, in an office to display all of those awards you've won, or in an entryway or hallway to highlight your favorite mementos from traveling the world. The possibilities are endless with this multi-purpose curio cabinet that includes a solid wood top, two glass doors, glass sides, two glass shelves, and a mirror back. Even more so with the options to choose the wood type, hardware, and finish that complement your home. We received our cabinet this morning delivered in excellent condition. Excellent workmanship and we are very pleased with it.